he Taiwan News, like the Taipei Times, is a mouthpiece for the Taiwan independence movement. To be fair, the Taiwan News is slightly less biased than the Taipei Times. The Taipei Times usually spikes any story unfavorable to the Taiwan independence movement, hoping it will never see the light of day. Otherwise, these two Taiwan based Engish language newspapers are like Tweedledum and Tweedledee. “Time to sock it to the U.S.”, an editorial by Ryan Chieh, editor of the Taiwan News, offers us a revealing glimpse into the infantile, self-centered, narcissistic mindset of a typical member of the Taiwan independence nomenklatura. Time to sock it to the U.S.
Less than 12 hours before leaving on an eight-day trip to allies Paraguay and Costa Rica, President Chen Shui-bian decided to reject Washington’s offer to refuel in Anchorage, Alaska. Taiwan tried unsuccessfully to arrange transit stops in higher profile U.S. cities and felt the offer of Anchorage was an affront to the country’s dignity. I put the word dignity in scare quotes because Chen, the DPP, and the Taiwan independence movement have no dignity left to affront. Taiwan independence fellow travelers in the US may not have gotten the word yet, but in the hearts and minds of the Chinese people on Taiwan, the Chen regime, the DPP, and the Taiwan independence movement long ago forfeited any dignity they might once have had. Then believe the lower echelon DPP officials who blasted Chen, upper echelon DPP officials, and hardline Taiwan independence “elders” for thoroughly discrediting both the DPP as political party and Taiwan independence as a political ideal during a recent DPP political strategy conference. Believe the DPP’s own confidential, in-house public opinion poll, later leaked to the press, which revealed an 18% approval rating for Chen and an 18% approval rating for the DPP. Believe the political analysts of all political colors on Taiwan who suspect the 20 year young DPP may not survive past 2008. But returning to my original point, why did the Chen regime, the DPP, and the Taiwan independence movement take the offer of transit through Alaska as an affront to their dignity? Did the Pan Green camp take the offer of transit through Alaska as an affront solely because the US prohibited Chen from deplaning, from staying overnight, from holding press conferences and staging photo ops? No. The Pan Green camp took the offer of transit through Alaska as an affront because Alaska was, as they loudly protested, not “mei guo ben tu,” i.e., not part of the American mainland, not part of the continental United States, not part of America Proper. If you think I’m putting words in their mouths, read on. Taiwan News: Taiwan’s democratically elected president was not allowed to set foot on continental U.S. soil, [emphasis added] or to stay overnight in Anchorage or to address overseas Taiwanese groups … Regardless of whatever reason the U.S. had for acting in this way, all of Taiwan’s people should express their dissatisfaction and let the American government know that such treatment is unacceptable … a president of a sovereign country who followed diplomatic courtesies in applying for a stopover, was stunningly restricted to a distant northern land [emphasis added] by U.S. officials … The country’s people should express their indignation to the American government in protest. Comment: One of the Taiwan independence nomenklatura’s loudest grievances is that in 1895, the mainland Chinese treated the Taiwan region of China as less than fully a part of China. A century later, the Taiwan independence nomenklatura cites this as one of its “justifications” for demanding Taiwan independence. The reality, of course, was nothing of the sort. The reality was that a newly industrialized and vastly more powerful Japan held a gun to China’s head and forced an agrarian China to make a heart-rending “Sophie’s Choice.” When the militarily overmatched Qing court was forced to cede Taiwan to Japan, an outraged Chinese people considered the loss of sovereign Chinese territory an intolerable injustice that had to be redressed, sooner if not later. Fast forward one hundred years. When Chinese patriots on both sides of the Taiwan Strait insist that Taiwan must be reunified with the Chinese mainland, sooner if not later, they are restating their long held position that Taiwan is an integral part of China, and demonstrating unwavering consistency on the matter of China’s territorial integrity. Yet here we are in 2006, and what do we have but Taiwan independence Quislings meekly handing over Diaoyutai, a Taiwanese island of inestimable value, to Japan without even a whimper, let alone a fight. And they have the audacity to fault the Qing court for not putting up enough of a fight against Japan in order to hold on to Taiwan? At least the Qing court put up a fight. Yet here we are in 2006, and what do we have but Taiwan independence Quislings, many of whom are US citizens, living on “mei guo ben tu,” the American mainland, the continental United States, America Proper, holding the very view of Alaska that they accuse Chinese of holding about Taiwan in 1895. 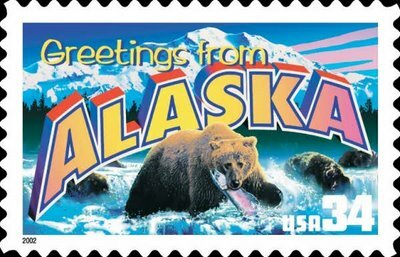 The Alaskan Independence Party considers Alaska to be “a distant northern land” not part of “continental US soil.” The Alaskan Independence Party however means this in a positive sense. The Alaskan Independence Party considers the Sovereign State of Alaska to be an independent nation, as specified in the Articles of Confederation. Taiwan independence Quislings also consider Alaska to be “a distant northern land” not part of “continental US soil.” Taiwan independence Quislings however, mean this in a negative sense. Taiwan independence Quislings consider Alaska to be of lesser status than the “Lower Forty-eight” because, as they loudly protested, Alaska is not “mei guo ben tu,” not part of the American mainland, not part of the continental United States, not part of America Proper. The State of Alaska’s proud inhabitants, both those who advocate independence, and those who advocate remaining in the Union, should “express their indignation to the DPP government in protest. ” Time to sock it to the Taiwan independence nomenklatura.